↑ "Al-Qaeda leader Osama Bin Laden dead - Obama". 2011-05-02. สืบค้นเมื่อ 2011-05-02. ↑ "FBI Ten Most Wanted Fugitives". FBI.gov. Archived from the original on January 3, 2008. สืบค้นเมื่อ May 26, 2010. ↑ Dan Eggen (August 28, 2006). "Bin Laden, Most Wanted For Embassy Bombings?". The Washington Post. สืบค้นเมื่อ May 26, 2010. ↑ "'Most wanted terrorists' list released". CNN. October 10, 2001. สืบค้นเมื่อ April 3, 2011. ↑ "Fbi – Usama Bin Laden". Fbi.gov. August 7, 1998. Retrieved May 15, 2011. ↑ "The Navy SEAL Who Shot Bin Laden Is: Rob O'Neill From Butte Montana". Soldier of Fortune Magazine. November 6, 2015. Archived from the original on December 3, 2014. Retrieved July 8, 2015. ↑ David Johnson. "Osama bin Laden infoplease". Infoplease. Archived from the original on January 20, 2008. Retrieved May 26, 2010. ↑ "Osama bin Laden", The Economist, May 5, 2011, p. 93. ↑ Beyer, Lisa (September 24, 2001). "The Most Wanted Man in the World". Time. Retrieved May 26, 2010. ↑ Steve Coll (December 12, 2005). "Letter From Jedda: Young Osama- How he learned radicalism, and may have seen America". The New Yorker. Retrieved May 26,2010. ↑ "A Biography of Osama Bin Laden". PBS Frontline. Retrieved May 26, 2010. ↑ Gunaratna, Rohan (2003). Inside Al Qaeda (3rd ed.). Berkley Books. p. 22. ISBN 0-231-12692-1. ↑ Michael Slackman (November 13, 2001). "Osama Kin Wait and Worry". Los Angeles Times. Retrieved May 26, 2010. ↑ "Osama's Women". CNN. March 12, 2002. Retrieved May 26, 2010. ↑ Amy Zalman, PhD. 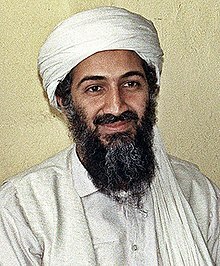 "Profile: Osama bin Laden". About.com. Retrieved May 26, 2010. ↑ "Osama bin Laden's family 'stranded' in Iran, son says", The Telegraph. July 19, 2010. ↑ ABC News. "Blood Brothers: Could Osama Have Been Tamed?". ABC News. หน้านี้แก้ไขล่าสุดเมื่อวันที่ 12 มีนาคม 2562 เวลา 01:01 น.